Join the WeHeartNerds Crew as Doug leads them through this continued adventure of the Dresden Files RPG. Doug did a hell of a job with this story, set in Portland, OR in the winter of 2013. Matt‘s hijinks are still a blast for most (and a bother to Doug, who’s trying to guide this hap hazard band through this adventure) and we hope it makes for entertaining audio. Thanx for listening! Should you be interested in subscribing to this podcast, you can subscribe to our feed! 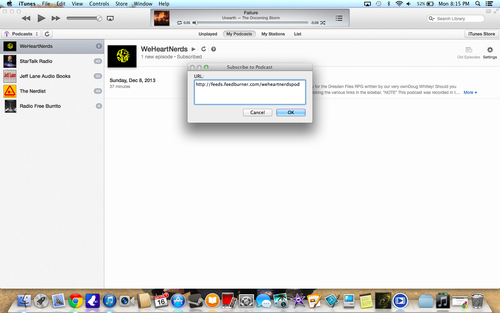 iTunes subscription will be available in the coming weeks. I’ve thrown a couple of screen shots at the end of this post for those of you that would like to subscribe to our feed in iTunes now. 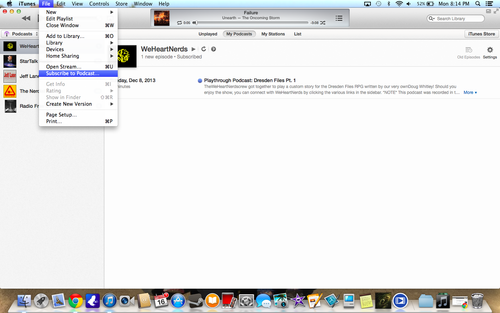 Just copy the link to our podcast feed and paste as shown. So what do you think? Should Levi have put more points into “Parenting” during character generation? Let us know in the comments below. You can get your own copy of The Dresden Files RPG from the great people over at Evil Hat Games, should you so be inclined.